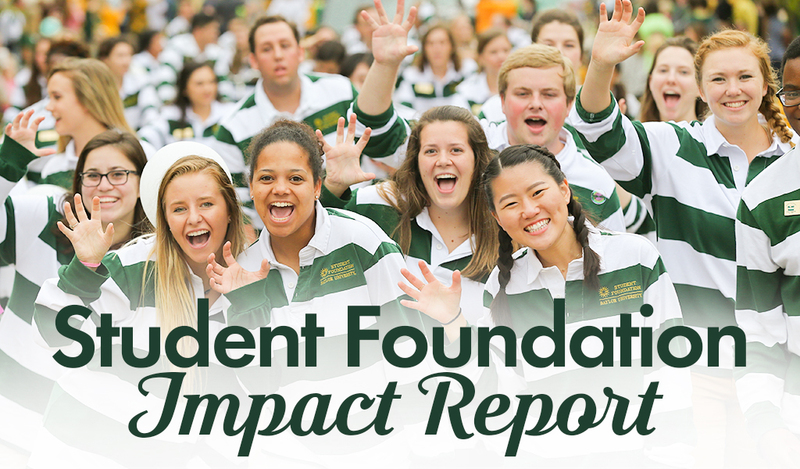 In 2016-17, Student Foundation continued our nearly 50-year tradition as a prestigious pillar of the student leadership experience by serving the Baylor community in key ways. Words cannot describe how thankful I am that people are willing to invest in my education. I am incredibly grateful. Since I intend to spend a large portion of my career overseas working in low-income areas, any amount of money that I put towards my education now rather than taking out a loan helps tremendously." "The Bearathon was a wonderful experience to showcase all of the different types of leadership and commitment within Student Foundation. The event allowed me to see just how intrinsic our work is to the Baylor community and how fortunate we are as a university to have such a great relationship with the city of Waco." In addition to guiding campus tours, we assisted with more than 65 recruitment events, including 45 college fairs, around the State of Texas and throughout the nation. "I love getting to travel around Texas and around the country sharing with high schoolers how much I love Baylor. Even getting to tell one potential student how Baylor has impacted my life is so fun!" Our student leaders answer the call to serve as Baylor’s premiere community builders and ambassadors to alumni, friends and prospective Bears. Student Foundation alumni depart campus equipped as leaders with the skill and motivation to serve their alma mater, their communities and their world. "Being able to work with different groups on campus to help put on events like the All-University Thanksgiving Dinner made me feel connected to my peers and campus in a unique way. It is rewarding to reach out to and help over 8,000 students." Immediately after the Parade, join us for a reception at the Ed Crenshaw Student Foundation Center (1522 S. 5th Street). RSVPs are encouraged. Receive a $10 discount per ticket for the Homecoming Parade Grandstand. Included are a general admission bleacher seat, boxed breakfast and bottomless coffee and juice. Use the promo code STRIPEUP17 at home screen for the Homecoming Parade Grandstand Seating tickets. All proceeds benefit Student Foundation scholarships, with a portion of each ticket purchase eligible for gift credit. Grandstands are made possible by the Baylor Chamber of Commerce, Student Foundation and donors.